"Lucía Lilikoi is able to generate with her music consciousness levels worthy of a true pagan priestess." Music is the Universal Language, let's talk. "Lucia is an extraordinary artist of these turbulent times. She writes, sings and plays music that embraces the difficulties and speaks of the issues, while soothing us so we can keep faith and courage. What a blessing is this music! We need you Lucia, so set sail with your music."~Rhiannon. “Lucia is a ‘new Pagan’ (The Pagan Love Orchestra) and a wonderful addition to the gang. I’m always stunned by the beauty and translucent quality of her voice.”~Jai Uttal. "Lucía Lilikoi is able to generate with her music consciousness levels worthy of a true pagan priestess. Her third album carries the evocative title ‘Vessel’, a small master piece of intimist pop which proposes a journey through water as a means of purification and personal growth.”~Territorios Sevilla Festival. “An intoxicating combination. In her startlingly beautiful lyrics she is not confined by the strict limits of rhyme. She has created a record that challenges listeners to open themselves up to sounds that are dreamy and different, to go on the voyage with her. "~Marin Independent Journal. "An excrutiatingly beautiful recording. It captures the balance of pathos and beauty in 15 songs, creating a world that is difficult to leave. Simply and elegantly produced. A seamless vision and a lovely compelling voice. "~Jeffrey Wood. Fantasy Studios. Lucía Lilikoi is a daring, creative and original singer, composer, multi-instrumentalist and artist born in Spain, living in the San Francisco Bay Area. Her distinct and sensual voice allures the listener into a translucent world in a genre she calls 'dream folk.’ She combines voice, piano, ukulele, guitar, looping pedal, and other instruments gathered in her travels, to alchemize them into imaginative pieces and spellbinding performances. Over the years, Lucía has collaborated with artists like Grammy nominated Jai Uttal, pianist and co-producer of her album Vessel Julie Wolf (Ani Difranco, Joan Baez, Sia), producer of her album Tame the Night, Grammy-winning producer Malcolm Burn (Bob Dylan, Emmylou Harris, Jeff Buckley), Jonathan Richman, Joey Maramba (Rickie Lee Jones, John Cale), Lorca Hart, Chris Haugen, Murray Kyle, Ravi Ram, and Sudhananda, amongst many others. Recently, her song “One Hand to the Sun” was part of the Kirtan Aid album alongside Rising Appalachia, Tina Malia, and Deva Premal. Her songs ‘Angel’ and ‘Dreaming’ have been featured on the show ‘The L Word,’ and she has scored music for documentaries ‘Sold in America,’ and ‘The Future of Energy,’ featuring luminary Buddhist ecologist, Joanna Macy. 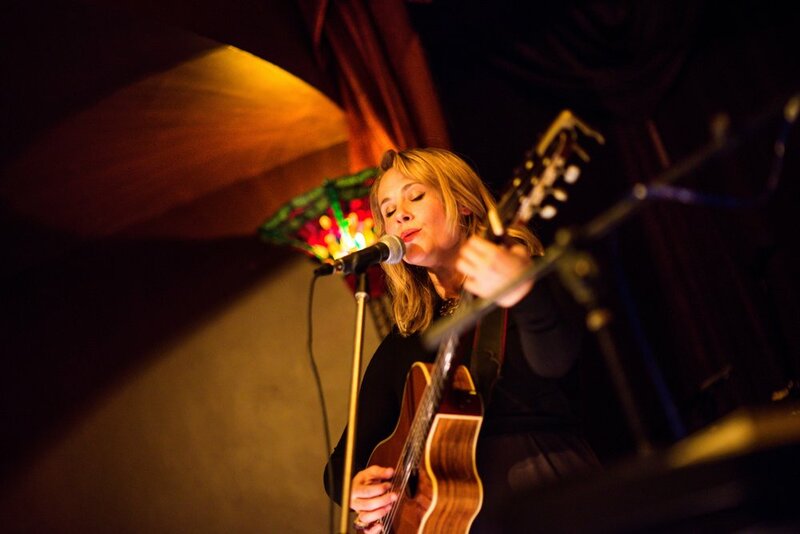 Lucia has performed her original work at prestigious venues all over the world, including The House of Blues Hollywood, The Alcázar of Sevilla, Natural High Healing Festival in Finland, Esalen in Big Sur, and Gibson Guitar Studios in London. Lucia is currently recording her fourth album, LUZ. These songs are invocations and love poems to the earth, the elements, and our place within the natural realm. They are both, a call to action, and lullabies of refuge for the gathering of the tribes. Through music, she believes in the power of our subtle bodies to regenerate, remember and reconnect to the primal LIGHT. A counterpoint to her third album, the Neptunian Vessel (‘An excrutiatingly beautiful recording’~Jeffrey Wood, Fantasy Studios,)which narrated the Heroine’s journey through water, the songs in LUZ embody the theme of belonging and standing on the earth, to cause a shift through purification, the reclaiming of our voices, and facing our personal and collective journeys. Lucía grew up in a musical household (her father is guitarist Manuel Imán), she started studying piano at 7, and she hasn’t stopped since. At home she listened to a myriad of artists; Peter Gabriel, Annie Lennox, Caetano Veloso, Tori Amos, Jimi Hendrix, Portishead, Joni Mitchell, Elton John, Pavarotti, Chopin… Her love for music led her to classical piano studies at the Madrid Conservatory, Vocal Jazz and composition at Berklee College of Music, Sound Healing at the California Institute of Integral Studies (CIIS), and vocal improvisation from master teacher Rhiannon (Bobby McFerrin).